Hello, in the last two weeks, while the mouse pointer is on the client machine, it will go back to the server machine's desktop about every one or two minutes. I've never had this issue before. I uninstalled and reinstalled on both machines with no change. Can you offer any suggestions? Hey there tcgeo. Please provide us the logs so that we can take a look at the details of it. File attached Paul, thank you! Synergy is becoming unusable with this issue, meaning it’s happening much more frequently, sometimes now several times in a row and the mouse occasionnaly disappears as well.. The server machine is Win 10 Home 64bit, running Synergy version: 1.8.8-stable-c30301e. Use SSL encryption is unchecked. The client machine is running Win 10 Pro 32bit, running Synergy version: 1.8.8-stable-c30301e. Security is Windows defender on both machines. Is it possible that I have to set/re-set Windows Firewall inbound & outbound port settings? Hi @tcgeo. Please set your machines to Debug1 and send us a copy of the logs. Also, can you confirm if both machines are connected to the same gateway? A screenshot of the Synergy interface on both would be helpful too. Thank you for the additional information by the way. Before setting the firewall rules back to default, it might be helpful to try and disable it first on both and try it while it's off. Hi @tcgeo. For setting your machines to Debug1, follow the steps below. Please set both machines to Debug1. Once done, use Synergy normally. When you experience the issue again, copy the most recent logs it generates and post it here. For screenshots, you can use snipping tool which is built in Windows 10 machines. Just press Windows button and search for snipping tool. I have exactly the same issue - both machines running Win10 Pro 64-bit V1607, and Synergy 1.8.8-stable. I see it sometimes as if the mouse 'bounces' against the edge of the screen (in fact it is repeatedly moving to the client machine from the server and moving back again, as you can hopefully see from the logs). Sometimes this happens 2 or 3 times in quick succession so is not that noticeable, but sometimes the mouse jumps back to the centre of the server machine and so you have to move a long way to get back to the client. 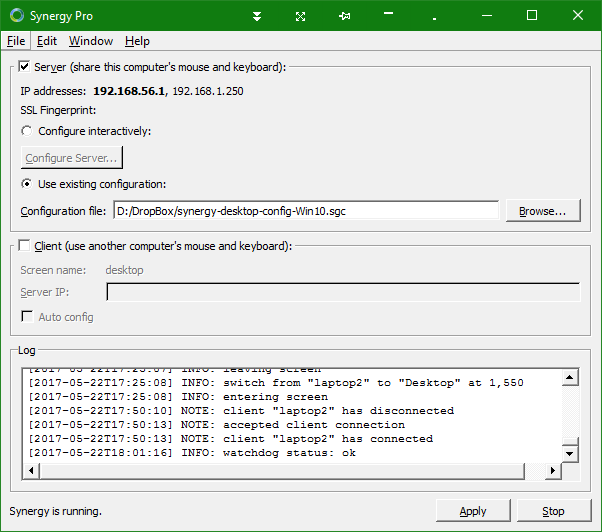 As a side note, there are some things would be _really_ help with Synergy logs - being able to clear the log window, and being able to insert markers would really help. It took me quite a while to capture a 'clean' log of this, especially at DEBUG1 setting. The significant start point is line 135 in the server log - this is where I tried to move the mouse to the client, and the corresponding line is 29 in the client log. Then there a rapid series of switches after the clipboard is copied, and this is where I saw the mouse 'bounce' from one screen to the other. Hope this is the data you need. This would be the same behaviour if Client1 was powered down, for example. I guess that's just a symptom of Client1 disconnecting, but which end of that connection is the one which terminates it I'm not sure. Please advise if there's anything else you need to investigate this - it's really frustrating, and has on one occasion caused me to type something confidential into an active Server window when I'd clicked on a Client window. Does that happen when you have your log-in screen on client 1? Yes, it always happens when the client is at the windows login, but that is not the only time. Once logged in, and without a screensaver or power saving on either client or server, I would say maybe 3 times out of 10 I can get the mouse to move straight from server to client without 'looping' round to the centre of the server screen. Once it has looped back to the server, the worst case I've seen was 5 attempts before it stayed on the client. Normally 2 or 3 is enough to get it to stay. Can you show us a screenshot of your Server Configuration interface? No. 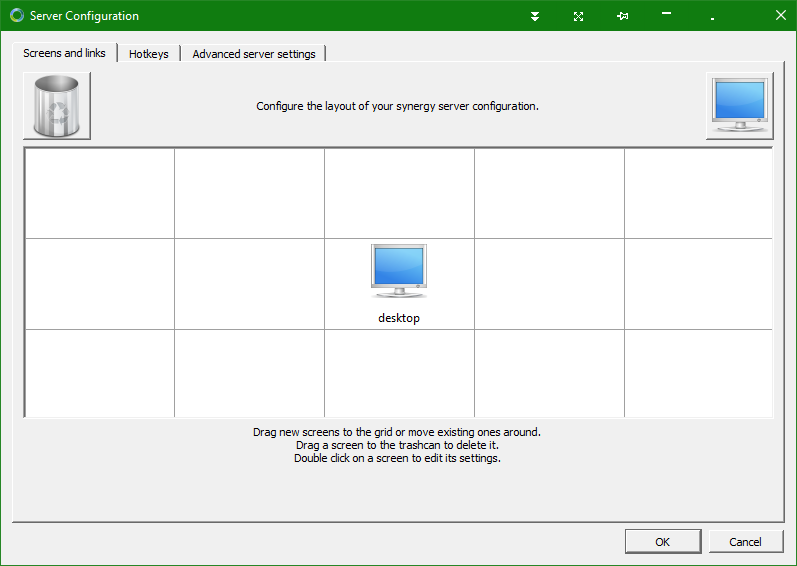 Click the configure server ( configure interactively should be activated). I'm not sure what that gives you - Synergy doesn't appear to load the current config file that I'm using into the interactive config screen. In fact, that was something else I was going to post about. I've used the text-based configuration to map some mouse buttons for use with a Mac (the 2 commented out lines in the config file I sent you). You need to set that up first. You can refer to Getting started with Synergy knowledge base article. Paul, I'm not sure exactly what you're asking for here, but I've been experimenting with my original config, and I think I've found the culprit - at least for me. If I set `win32KeepForeground = true`, the mouse behaves perfectly, but mine was set to `false`, which I've now changed. My reason for setting it to `false` are lost in the mists of time - I can't remember what problem that was solving, and it was almost certainly 2 OS versions ago, so hopefully isn't needed anymore. Note I still do see the disconnect at the windows login screen - on 'activating' the password login box, the client disconnects and the mouse jumps back to the server. But I imagine that is a different root cause, and not an easy one to debug from the client side, as it starts before even logging in to get to the Synergy console. Thanks for the update @David Lomas. The disconnect issue on the login box is caused by the UAC. Our developers are still trying to figure out if we can do something about that as it is an OS security behavior that does that. so I never see it in normal use. But for login, I guess it could still be lurking there. I sent you requested data on May 21 and haven't heard back from you. Any updates on this issue, as it continues to be very difficult to work with? Hi @tcgeo. Sorry for the late reply on this. Have you tried using v1.9? You can get it from Download Synergy 1.9-rc3 (Fixes the macOS WiFi lag bug) forums thread.